Definition at line 24 of file expanded-fst.h. Definition at line 26 of file expanded-fst.h. Definition at line 27 of file expanded-fst.h. Implemented in fst::CompactFst< A, ArcCompactor, Unsigned, CompactStore, CacheStore >, fst::EditFst< A, WrappedFstT, MutableFstT >, fst::VectorFst< A, S >, fst::VectorFst< fst::ReverseArc >, fst::VectorFst< fst::ArcTpl >, fst::VectorFst< Arc >, fst::NGramFst< A >, fst::ConstFst< A, Unsigned >, fst::MatcherFst< F, M, Name, Init, Data >, fst::MutableFst< A >, fst::MutableFst< typename internal::EditFstImpl< A, WrappedFstT, MutableFstT >::Arc >, fst::MutableFst< typename internal::VectorFstImpl< S >::Arc >, fst::MutableFst< ToArc >, and fst::MutableFst< Arc >. 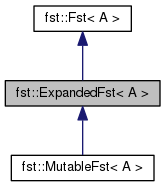 Implemented in fst::ImplToExpandedFst< internal::ConstFstImpl< A, Unsigned > >, fst::ImplToExpandedFst< internal::NGramFstImpl< A > >, fst::ImplToExpandedFst< internal::AddOnImpl< F, Data > >, fst::ImplToExpandedFst< internal::CompactFstImpl< A, DefaultCompactor< ArcCompactor, Unsigned, CompactStore >, CacheStore > >, fst::ImplToExpandedFst< internal::VectorFstImpl< S >, MutableFst< typename internal::VectorFstImpl< S >::Arc > >, and fst::ImplToExpandedFst< internal::EditFstImpl< A, WrappedFstT, MutableFstT >, MutableFst< typename internal::EditFstImpl< A, WrappedFstT, MutableFstT >::Arc > >. Definition at line 35 of file expanded-fst.h. Definition at line 63 of file expanded-fst.h.